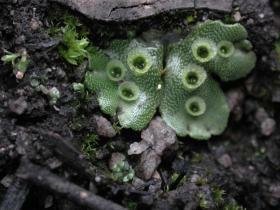 Broad-leafed Marchantia M berteroana Photo E Collins The cup-like structures are gemma cups which hold small buds. These buds are washed out by raindrops.The tiny dots are openings to air chambers in the thallus. Photo E Collins The cup-like structures are gemma cups which hold small buds. 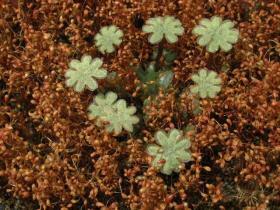 These buds are washed out by raindrops.The tiny dots are openings to air chambers in the thallus. 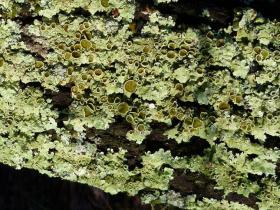 Unknown Lichen on dead wood. Greenshield Lichen Flavoparmelia sp Photo E Collins A common foliose lichen on wood.The discs are fruiting bodies which produce the spores of the fungal partner. 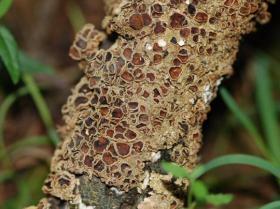 Photo E Collins A common foliose lichen on wood.The discs are fruiting bodies which produce the spores of the fungal partner. 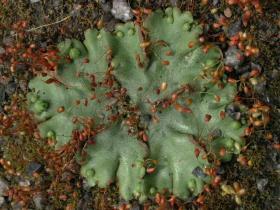 Broad-lobed Marchantia. M berteroana Photo E Collins The "umbrellas" are immature and there are no gemma cups.This photo was taken post fire and The Fire Moss and Lichens were among the first colonizers of the bare ground. Photo E Collins The "umbrellas" are immature and there are no gemma cups.This photo was taken post fire and The Fire Moss and Lichens were among the first colonizers of the bare ground.